We write with great concern to inform you that a man wanted on charges of genocide may be seeking to stay in one of your hotels. Sudanese President Omar al-Bashir, who is wanted by the International Criminal Court, applied for a United States visa to attend the United Nations General Assembly meetings. President Bashir is sought by International Criminal Court on charges of genocide, war crimes and crimes against humanity for his actions in Darfur. The UN estimates that 300,000 Darfuris have lost their lives since 2003, and over three million have been displaced as a result of Bashir’s actions. To this day, Bashir continues his reign of impunity, attacking Sudanese civilians and using food as a weapon of war by intentionally blocking international humanitarian organizations from delivering aid to those who need it most. At a news conference on Sunday, September 22, President Bashir announced that he has cleared his flights and booked a hotel for his visit. It is very likely that the hotel he seeks to stay in is a member of the Hotel Association of New York City. The visit of this man is a moral outrage that cannot be allowed to stand. In the face of genocide, war crimes and crimes against humanity, we must stand with the victims in Darfur and other parts of Sudan. We strongly urge the Hotel Association and all of its members to deny any request for accommodations for President Bashir. Allowing Bashir into any hotel of your association would send the wrong message to your guests, staff and neighbors and most importantly, would be a huge disgrace to the victims of the genocide in Darfur. 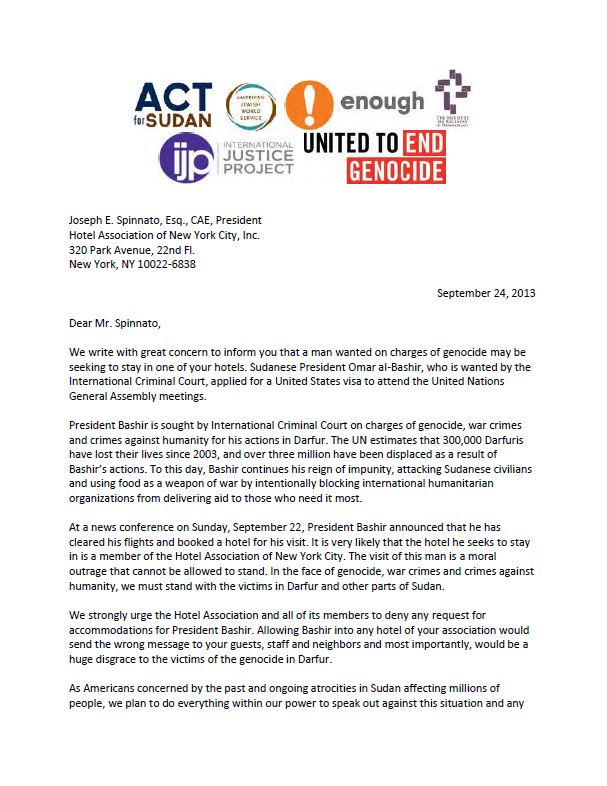 As Americans concerned by the past and ongoing atrocities in Sudan affecting millions of people, we plan to do everything within our power to speak out against this situation and any hotel or entity that hosts President Bashir. We support your Association’s thoughtful response to this unique challenge. Along with the Sudanese diaspora, celebrity activists, human rights organizations, and student groups, we will be amplifying efforts to highlight atrocities committed by Bashir’s regime through our own public activism.